Lorilee Beltman will share her explorations in adding color to our knitting. There are many ways that color can be added when contrast stitches climb vertically from round to round. She’ll tell us all about them. Lorilee is teaching workshops for the Guild on Wednesday and Thursday. Lorilee Beltman is widely popular for her teaching expertise and skills. She is constantly in demand to teach at Stitches and many other national conferences and retreats. 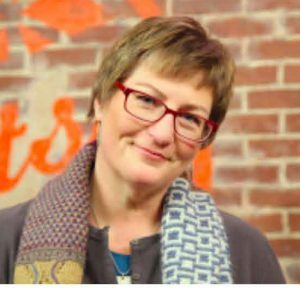 This former yarn shop owner’s experience, providing answers for a steady stream of questioning knitters, taught her the value of delivering an honest answer with kindness. Lorilee is also an instructor at Craftsy.com and Interweave, a Craft Yarn Council certified knitting instructor, a TNNA designer/teacher member, and the former Techniques columnist for Knitty.com. Her articles and designs have been published in The Ultimate Hat Book, Blue Moon Fiber Arts Rockin’ Sock Club, Vogue Knitting Magazine, Interweave Knits Magazine, Interweave Sockupied eMag, Twist Collective, and Beyond Toes by Judy Becker.